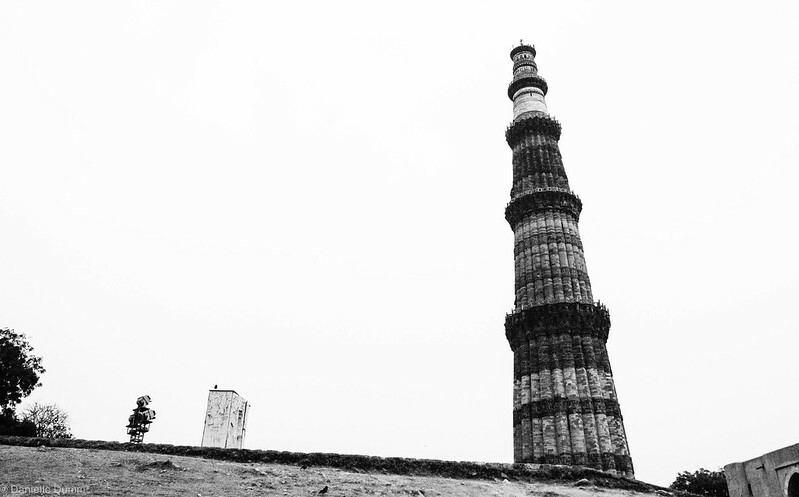 Qutub Minar–and the only photo I snagged of the mysteriously rust-less iron pillar. In that same way you can feel a prickly scratchiness at the back of your throat before a raging fever sets in, I can feel the prickly ugliness of a little bit of culture shock beginning to cast a shadow on this stage of our time here. I’m feeling two different kinds of culture shock really, towards both India and, as a friend here calls it, the “cruise ship” lifestyle of living on an embassy compound. 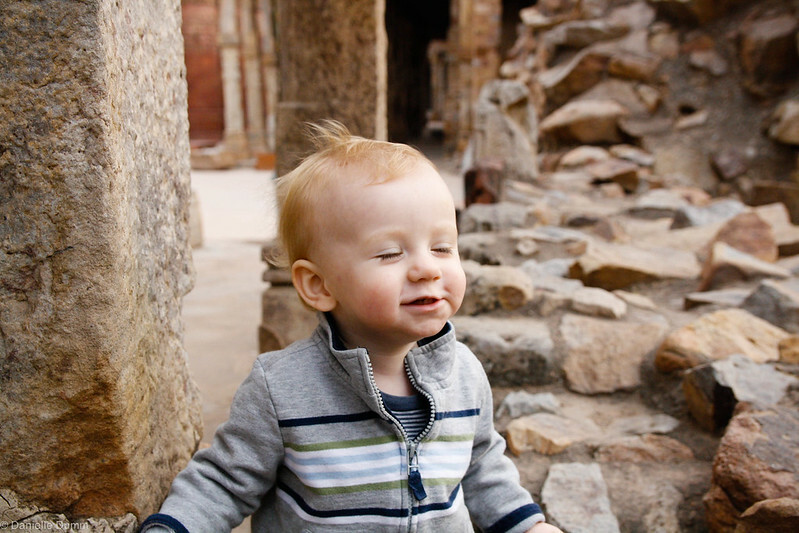 I hate to really complain about these things because–for every leering, innuendo-spewing pervert in Delhi, I know at least four or five wonderful men who’ve helped me with my stroller, held open a door, or simply said “Hello” in the most respectful and kindly way. For that one horrific incident we had in Lodhi Garden a few weeks ago where a woman, shouting and snarling, tried to grab Will out of my arms over and over until her husband intervened and Will was shaking in terror, we’ve had dozens and dozens of kind people since then nod understandingly as Will bursts into tears whenever anyone so much as tries to stroke his cheek. And for as much as it sometimes feels like a social gauntlet to exchange greetings with at least 25 gardeners, sweepers, guard, nannies and neighbors every time we step out our front door, it’s also an incredibly nurturing environment for Will to toddle around in, knowing that everyone he meets will smile and wave every single time they see him–even if it’s the 16th time that day. I miss “real India” living here with so few markets, stores and restaurants within walking distance, but it is so very nice to come home to great neighbors, quiet green lawns and a home where the generator faithfully kicks in 5 seconds after every power failure. I can’t deny though that this week I’ve begun to think about where we might go next instead of simply relishing our short two years here. My instinct, when the culture shock is just starting to kick in is to retreat, to hibernate, to stay at home where its comfortable and easy and where I can very nearly pretend I’m not in India at all. I’m learning though that this is often, paradoxically, the absolute worst thing I can do to cope. As isolated and “Americanized” as our lives are here, the more that I cling to all things familiar, the more jarring the foreignness becomes. And after awhile a certain amount of inertia can take hold. The longer a person stays at home and avoids going out into the city, the more insurmountable the challenges seem and the harder it gets to simply pack a bag, hail a taxi and just go somewhere. 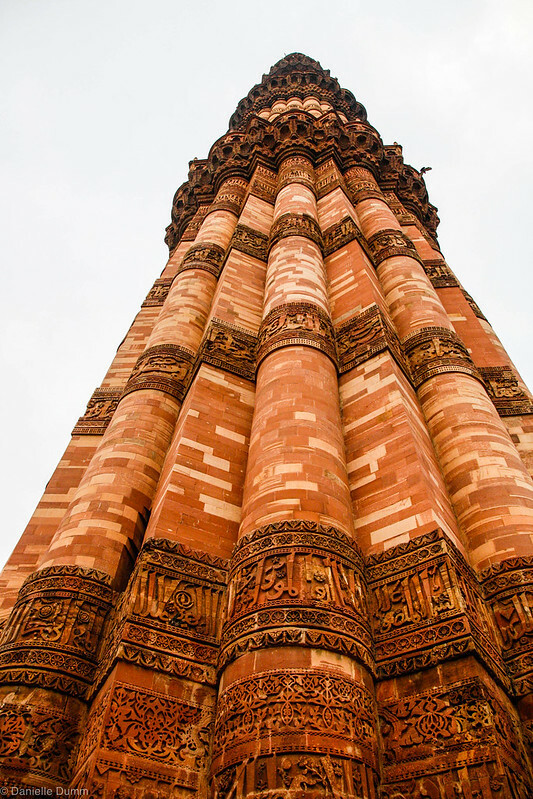 So, with these things in mind, I asked our driver if he’d mind a few hours of early morning overtime pay, woke Will up before the crack of dawn, hustled him into his car seat, blew off warnings of unseasonal morning showers and away we went to Qutub Minar. I’d been wanting to visit for months and today seemed as good a day as any to do it. The things that can be annoying about our India experience were still present–the touts, the baby-cheek-pinchers, the men talking about me as they huddled just over my shoulder and refused to budge. But these things that can be so maddening when they take place on a quick shopping trip, or during what should be a routine trip to the park, are always overshadowed by the magnitude of the experience when we’re out visiting someplace new. 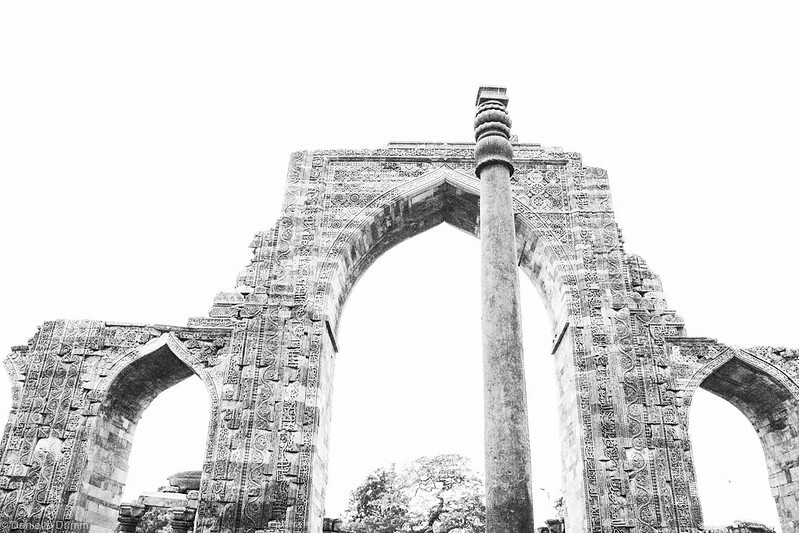 I had hoped to catch Delhi’s beautiful sunrise over the ruins and get home before rush hour traffic took over the city. With lingering rain clouds hovering over the site, we at least did well on our second goal. By 9am we were back in New Delhi and I realized we had time for another culture-shock-busting secret: when in doubt, indulge in what you love about where you live. If it’s the sites, go sight-seeing. If its the shopping, go shop. If it’s the food, go eat. If its that one place on the edge of town that is half-way pretty if you squint your eyes and pretend not to notice the sewer smell, go there. As for me, I like food. 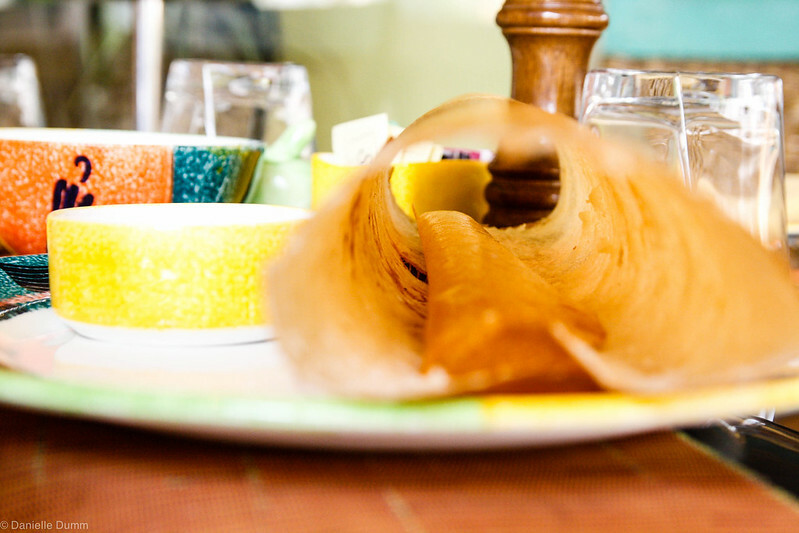 I particularly like South-Indian dosas–a treat that’s hard to find here in Delhi, especially if you want it done right. I can’t say that I know where to find the absolute best dosa in Delhi yet but I’ll tell you this, the coffee shop at the Taj Ambassador by Khan Market is an excellent cure for culture shock. I could buy 20 dosas in Chennai for the $10 I pay for a cup of chai and a dosa and 30% in taxes at the Taj, but the wafer-thin dosa and the spicy sambar and the kitschy old-world atmosphere of that sunny little cafe make the indulgence worth it And it’s a heck of a lot cheaper than a plane ticket home. We’re back home on the “cruise ship” now, but I don’t feel quite so prickly as I did before we got out this morning. I’m sure I’ll have my moments again very soon, but for now, owing mostly to an especially good dosa, the worst of the culture shock has been momentarily averted. How do you deal with creeping culture shock? Pssst. 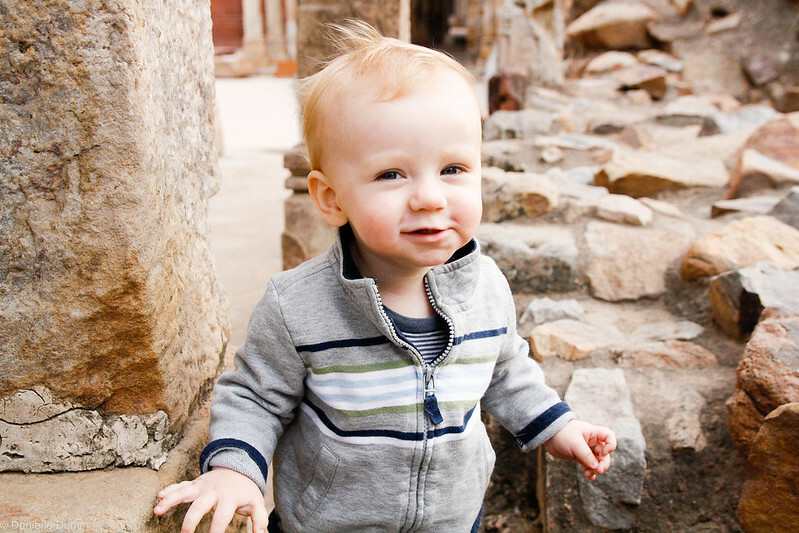 I did a guest-post for one of my favorite expat bloggers, Wanderlustress, over at World Moms Blog this week. Click over to check it out. Also, want to read a really, really long post on making sourdough bread at home? I’ll post my recipe and tips later this weekend. my cure today for life on the compound is to leave and go visit with the Canadians! I wish the Canadians had worked out! Hopefully next time! I’m not dealing with my culture shock here very well at the moment and need to find some alone time without other obligations on my mind to at least write about it. I need the stillness you referred to in your last post, but when? Thanks Dee, I think we’re not quite to the worst of the culture shock which makes getting over these little bumps a bit easier. But I think living in a huge place like Delhi where there is always something new to do and see makes a huge difference. I think smaller places are harder for that reason. I am glad you found a way out. Part of it is understanding bit about how the lives in india are entwined, the culture, circumstances and that will calm you down and feel safe around people. But beware, sometimes few bad people can take away good impressions altogether..as you say! Take care and Merry Christmas! Thank you for your thoughts and I agree, its through understanding why things happen the way they do in the place ou live that makes living there both interesting and easier. Merry Christmas to you soo! Your photos of the historic sites are wonderful. The birds flying! The towering brown/red pillar! Amazing. But I have to say my favorite is the shot in the cafe! Food gets me through it all too! Right at this moment I would do about anything for a perfect cheeseburger, shoe string french fries and a holiday ale! When I start to feel prickly I usually end up blaming it all on my household staff (in my head at least). Then I bust out my cookbooks, needle and thread or my camera! Going out to find something new to photograph always makes me feel better. Can’t wait for the new one to arrive. In the mean time I can ogle over your photos. I feel like I need to pick your brain about photography. My new camera is eons more advanced than my old Nikon. Do you shoot in JPEGs or RAW? What mode do you shoot in mostly. I like aperture priority. Do you mess with white balance, D-lighting, settings and such? Let’s chat! I wish there was something I could say or had some wisdom for you, but since this is my 1st post, I am learning as I go. Just know that I appreciated your kind words when I was going through my shock and that I will be thinking about you and wishing you and your family all the best, especially over the holidays. Thanks so much Tiffany! I really appreciate your kind words and warm thoughts! Hope you guys are doing well in Bosnia! I mean, how can you not want to pinch those little cheeks! But I agree, it is rude. I think you are very brave — not just for venturing out to parts of the city that (I’m guessing) a lot of other expats/Americans wouldn’t go, especially with a toddler in tow, but for doing the exact opposite of what your natural inclination is. It’s hard to venture outside of our comfort zones and so much easier to stay in, to do what’s familiar. I’m sending you and your family happy thoughts. I know you will get over this little hump of culture shock as you always do! Pshh not brave at all. Every time I think I’m doing something “cool” I always find out that someone is doing something even more fun and adventurous and interesting than me. It is helpful though that is is a huge city with so much to do! Lovely photos, as usual! Your wee man is so cute. THank you so much, what a great piece I really learned a lot from it! First, his cheeks are yummy. If or when I get to meet him live I will have to indulge in pinching him just once… 😉 For me it’s the markets… I try to visit them often but it’s not always easy… As for the post at WMB, I loved it! I have yet to comment there! It’s been a whirlwind of a week! Thanks Ana! Oooh the markets yes! They are always wonderfully rejuvenating! By the way I met someone here who knows you! What a small world! Yes, he’s got amazing cheeks! My personal pick me ups are shopping (a good deal/interesting find), going someplace new (preferably out of town but if that’s not an option, fortunately, Delhi has a lot to offer), some quality me time (very hard to carve these days), a good movie (I have been indulging in some good Indian movies) and doing something creative (doing something with my hands is best but difficult with a toddler around). Thanks Daniela! 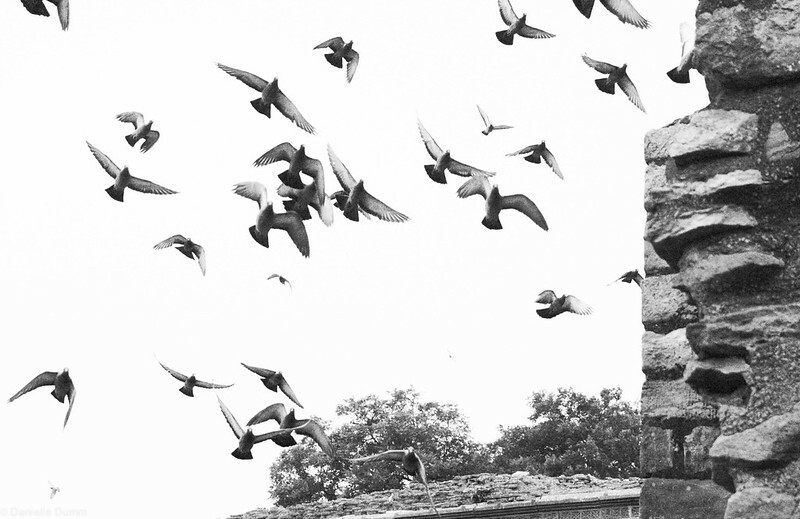 I agree Delhi has so much to offer, I think its kind of the saving grace. What good Indian movies have you been watching lately? That’s a unique coping strategy that I hadn’t thought to try! I’ve been stumped about my doldrums and wasn’t quite willing to tag it as culture shock. Your last couple of posts have convinced me that culture shock it is and that I should just own it and get on with cross-cultural living. Getting out is a good idea and I think I’ll learn how to say something new in Nepali for the occasion. It’s sooo tempting to deny culture shock because it seems like something that “good travelers” don’t get. But that’s so not true. We all experience it, often in many different ways. Being conscious of the fact that moods are part of a normal, healthy adjustment period and not necessarily the fault of the place our living always helps me avoid feeling ugly and instead simply mildly frustrated. Thanks for reading and best wishes! Your photos are gorgeous!!! Yes, the cheeks. Yummy. Boys are so cute. Now I have a boy, I see the world of boys differently! Thanks Kaho! Great to hear from you! Boys are a whole different experience from little girls its so true! Great blog Dani! I found you through Joanna on A Cup of Jo. And I absolutely love it! It makes me miss Delhi more and go back home right away. I am in DC and miss Delhi a lot. Esp so coz my parents live right next to Khan Market making Delhi extra special to me! Now, about the Dosas – I’m going to ask the obvious – have you tried Andhra Bhavan and/or Sarvana Bhavan. There’s so many places! Also, if you can (since I read you love food) try out the Delhi Food Tours – it was started by a friend and he has great taste, literally! Thank you for reading Gayatri! I have to say, I’ve since found my dosa nirvana here in Delhi since writing this post at a little place over in Defense Colony (well not little, it’s arguably the most popular dosa place in the city I think) You are right, there are so many places, it just takes being here awhile to start to figure it all out. 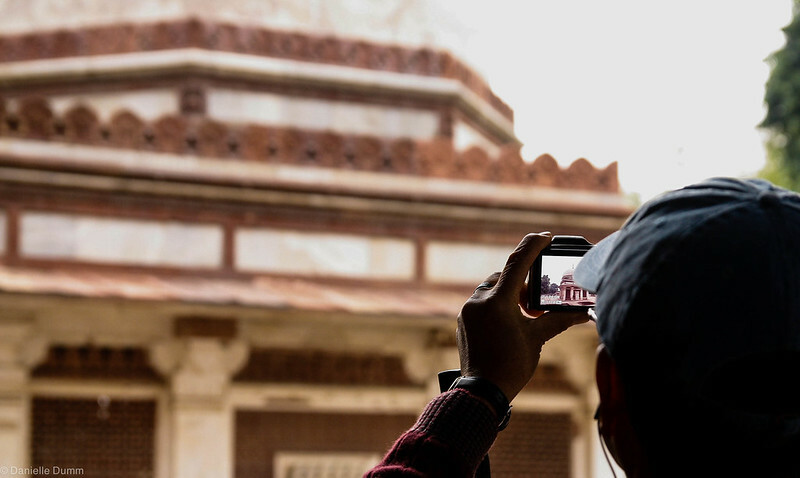 I’ve heard so many great things about the Delhi Food Tours, we have many friends who’ve done them. Up to this point, our son hasn’t been comfortable enough with us leaving him for more than a few hours to go do one but maybe soon!